Well, at Easter time you can never have too much chocolate. This festive Easter Chocolate Layer Cake by Shelley Judge is delicious layers of sponge, ganache and buttercream and is sure to impress your family and friends. Line 3 round 8-inch baking tins. In a large bowl whisk flour, sugar, cocoa and baking powder. In a jug or small bowl, whisk together vinegar, vanilla, olive oil and water. Then combine the wet ingredients into the dry ingredients until fully combined. Pour batter into the prepared cake tins. Bake in the oven for 20-25minutes or until a toothpick inserted in the centre comes out clean. Heat the cream in a small saucepan until it just starts to bubble around the edge of the pot. Remove from heat and stir in finely chocolate drops. Leave for 10mins before whisking with a fork to fully combine the cream and chocolate. Then allow to cool completely (30mins-1hr). Beat butter in a mix master for 5mins until light and fluffy. Add in the icing sugar, ½ cup at a time beating in between. Once all sugar has been added beat in 1 tbsp milk and beat on high for 2 mins until smooth. Add in 1/2 - 2/3 cup cooled chocolate ganache until you reach your desired colour. Place one chocolate cake on a plate, top with ¾ cup buttercream and spread to the edges. Place another cake on top and press down slightly to remove air bubbles. Repeat this step once more. Then top the final layer with remaining buttercream. For the Easter decorations, heat a large knife with boiling water then carefully slices the large Easter eggs in half. 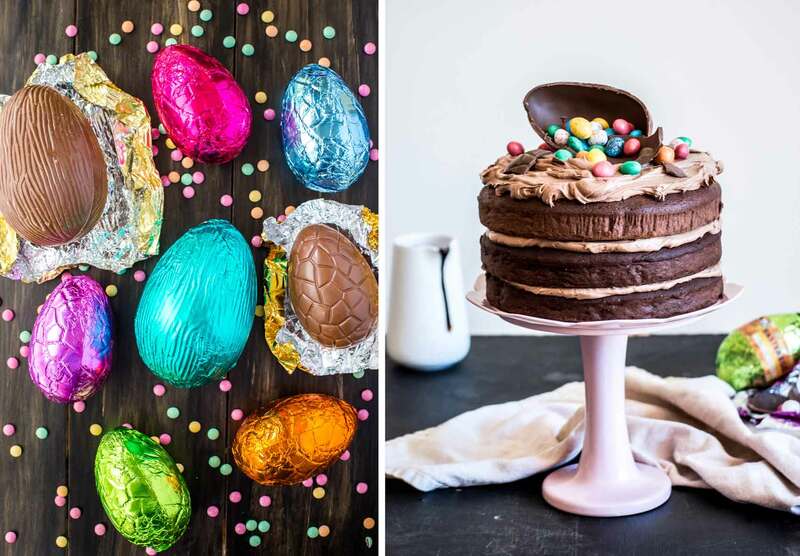 Place half of the egg in the centre of the cake and fill with little Easter eggs.